A hardy hibiscus, 'Kopper King' has leaves that are a coppery red on top and orange-red underneath. 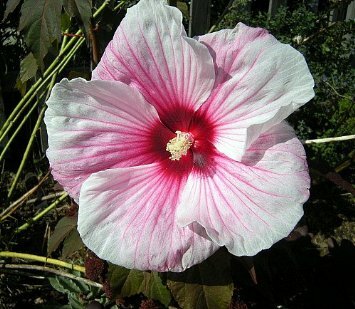 Large (10 to 12 inches across) ruffly white to pale pink flowers bloom from midsummer to mid-fall if you deadhead. 'Kopper King' dies back to the ground in autumn and is late to break dormancy in the spring. It should be interplanted with spring bulbs and overplanted with winter annuals; that way you'll get color year round without disturbing the hibiscus. Noteworthy characteristics: Coppery foliage; large, disc-like flowers that attract butterflies; long bloom period. Care: Provide full sun to partial shade and a moist soil high in organic matter.